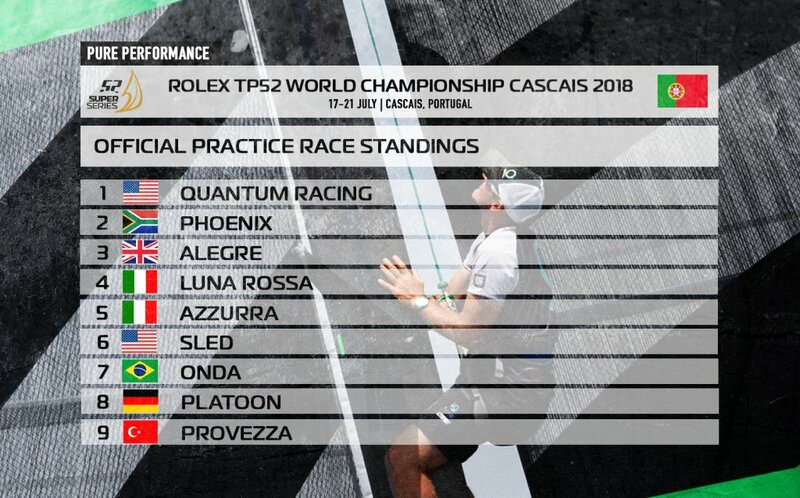 (Monday 16th July, Cascais) – The Rolex TP52 World Championship fleet today had a welcome taste of what the forecasters promise to be a “to order” typical week of northwesterly wind and waves as the nine-boat fleet completed their Official Practice Race. After the light winds of Croatia and the stifling temperatures that have prevailed in Northern Europe for the last few weeks, a decent brisk, cool Atlantic breeze of 15kts with puffs up to 20kts for the practice race, which was won five times world titlists Quantum Racing, was very welcome. Defending champion, owner-driver Harm Müller-Spreer remains relaxed around the dock at the Marina de Cascais. As a former Dragon class champion he has many year of experience in Cascais to complement his years in the TP52 racing here. The fleet’s outstanding Olympic medallist with perhaps the most experience of Cascais is Onda’s Robert Scheidt. He has raced Lasers and Stars here dozens of times, and sailed the Prada TP52 in 2010, and he, and his Brazilian compatriots feel very much at home. There will be live streaming of the Rolex TP52 World Championship Cascais 2018 all the way through the regatta, follow it via the website or on the app. 1. Quantum Racing (USA) (Doug DeVos) 73 p.
2. Sled (USA) (Takashi Okura) 77 p.
3. Platoon (GER) (Harm Müller-Spreer) 77 p.
4. Luna Rossa (ITA) (Patrizio Bertelli) 81 p.
5. Phoenix (RSA) (Hasso/Tina Plattner) 91 p.
6. Alegre (USA/GBR) (Andrés Soriano) 96 p.
7. Azzurra (ARG/ITA) (Roemmers Family) 98 p.
8. Onda (BRA) (Eduardo de Souza Ramos) 103 p.
9. Provezza (TUR) (Ergin Imre) 110 p.
10. Gladiator (GBR) (Tony Langley) 128 p.
11. Paprec Recyclage (FRA) (Jean Luc Petithuguenin) 136 p.